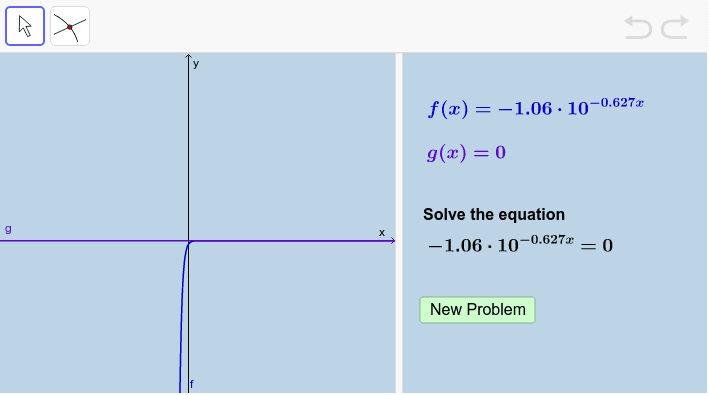 Directions: 1) Solve the given exponential equation you see on the right side of the applet. 2) Write an exact expression for the solution to this equation. (It should be written as a logarithm.) 3) Use your calculator to obtain an approximate decimal value of this solution (Round this value to the nearest 0.01). 4) Check the reasonableness of your solution by determining the coordinates (x, y) of the intersection of graphs f and g. Generate as many examples as you need and work through these examples in order to master this concept! Note: For some generated problems, you may need to ZOOM WAY IN or ZOOM WAY OUT in order to see the point of intersections of graphs f and g.